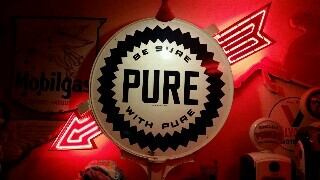 Hi im looking to buy a large not mint gas or oil sign, Im located in Michigan so it would have to be close or shipped! what i would really like to find is a mobiloil / mobilgas socony large shield sign. or a veedol Tombstone sign, or a large 6' gulf sign, american standard 6-7' sign. please let me know what you have and a price thank you. can travel to chicago to upper michigan or lower michigan too.